Home Miss Universe Miss Universe Tour Packages! Here's a lovely treat to all our kababayan in the US! Wanna watch Miss Universe in the Philippines? 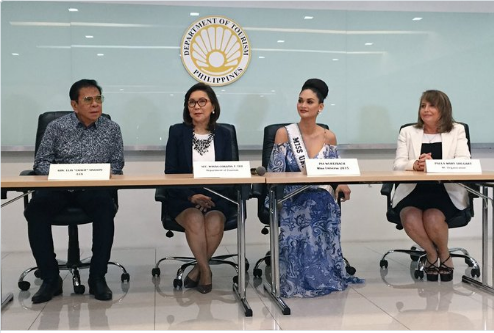 Aside from the chance to watch the Miss Universe live, DOT Secretary Wanda Teo revealed in a presscon this afternoon that the public will also be given an opportunity to avail Miss Universe tour packages. Miss Universe Group Tour Package starts at $1,195, inclusive of RT PAL ticket from New York to Manila, 4-nights accommodation (twin sharing) with daily breakfast at Sofitel, New World or Marriott Hotel, and hotel/airport transfers. The packages will not only be for Manila, it will also include Davao, Cebu, all the provinces. There will also be a Legazpi package, Palawan package, and more. Hurry up guys! Prices are subject to change but for more information, email at pdotnewyork@gmail.com. Email : pdotnewyork@gmail.com. Group Tour Package starts at $1,195 with RT airfare from New York or Chicago and 4-nights stay with daily breakfast at Sofitel, Marriott, or New World Hotel.